This attractive and highly detailed map of Tasmania includes all its provinces and landowners of the day. This engraving has original hand outline color. 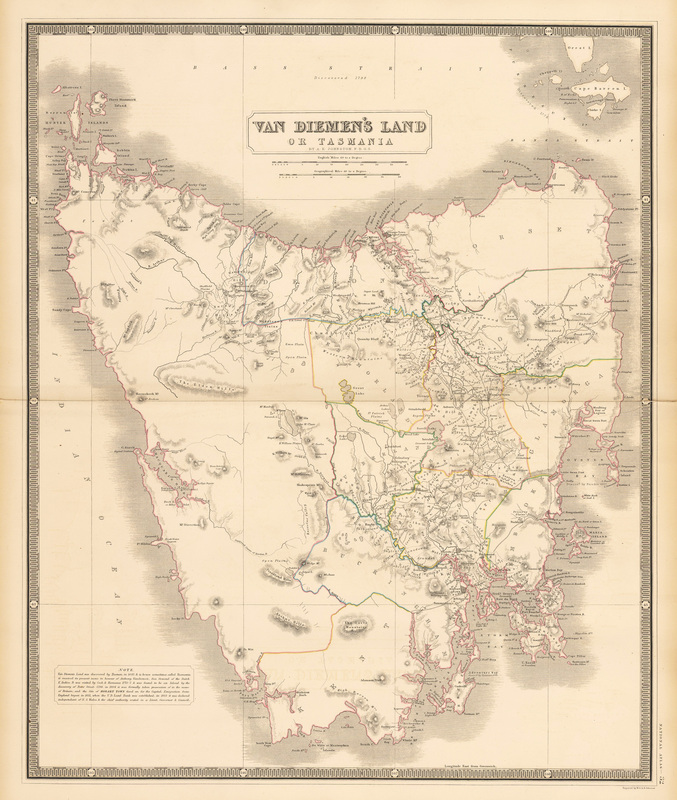 Beautiful and clear double page map of Tasmania divided into counties, circa 1850. Johnston depicts towns, major routes, waterways and all topographical features in great detail. A note at lower left explains the island’s colonial history. Johnston was a Scottish geographer and Fellow of the Royal Geographical Society and eventually Geographer Royal in Scotland, who worked with his brother William. The map features many of the names for the new land which were taken directly from Scottish landmarks and historical places. Condition: This map is in B condition on heavy, thick paper. A tear along the centerfold extends approximately 1.5 inches into the map. Other separations have been repaired with archival material on the versa. Light toning at the edges.